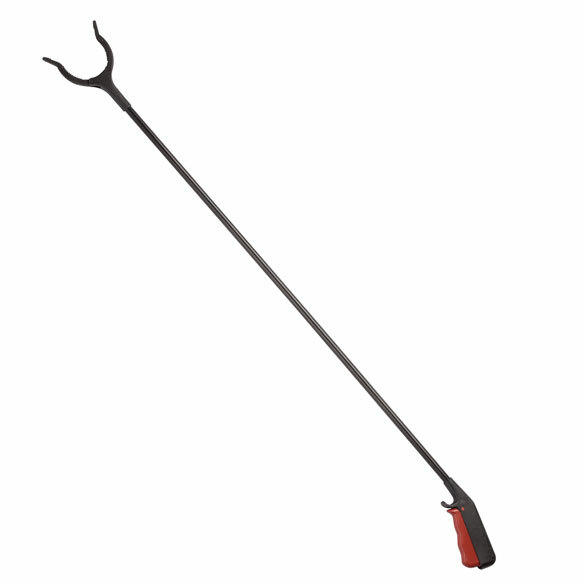 Extra long 40” reacher helps you pick up items safely and comfortably without bending or straining! Ergonomic trigger opens “fingers” to 3¾”W. Textured surfaces on reaching tool easily grasp or hook objects. Rotating head reaches at the right angle. Plastic reacher design is lightweight and durable. I purchased 3 of these because the reach was 41 inches. While the length is true the item is too thin and light weight to pick up anything other than paper. It is poorly constructed and flimsy. It was bent in two places (opposite directions) in an attempt to make it fit into the shipping box. I would suggest using a tube in the future. I straightened it with my hands but it's weak in these areas. I am in a wheelchair and can’t reach things. this item help me to reach things in my kitchen. I picked these two items because I wanted them. great for reaching under and behind objects. had one and wore it out. To keep my yard clean. I liked the longer reach. This is longer than the average Reacher. I am only 5' and need all the help I can get. Length is longer than others. We need another one of these, and this one is superb. Works very well. Good product. I had back surgery and I had to start using teachers. Have one by my chair but want one in closet. I have one of these already and wanted one that was a bit longer. As you age, you shrink. Can't reach as high as I used to! I have very tall cupboards and this will eliminate me from getting up and down on step ladders. I am in a wheelchair and I drop things. My husband wanted a reacher with more length. My husband uses to pick up limbs in yard when mowing.